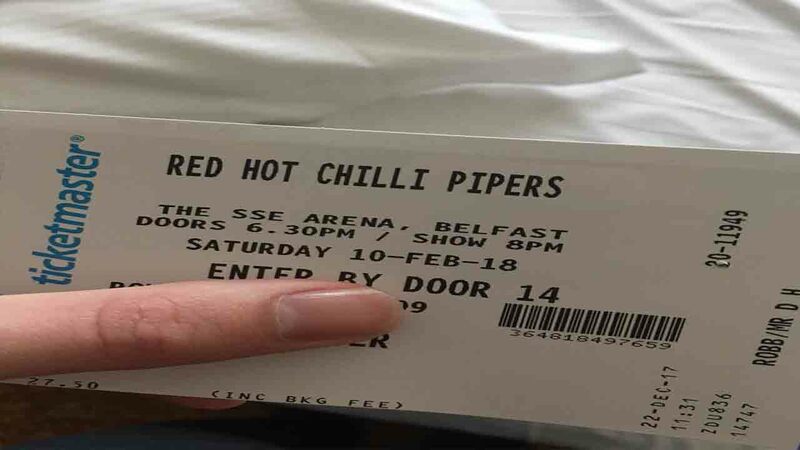 BELFAST, Ireland -- Duncan Robb had the best of intentions when he got tickets for his girlfriend's "all-time" favorite band, the Red Hot Chilli Peppers; however, in the days before the concert, his other half had a hilarious realization. Unfortunately, Robb didn't buy tickets to see the Red Hot Chili Peppers but the Red Hot Chili Pipers - "the most famous bagpipe band on the planet," or so their website claims. Robb told Storyful that he had spotted the gig while looking for tickets to a boxing match. Half Northern Irish, Robb - a Chesterfield-native - is a regular visitor to Belfast, so when he spotted what he thought were tickets for the Californian funk-rock legends in Belfast, he snapped them up. "When I clicked on and got tickets in row Q and for 30 each I thought what a bargain, there must not be many tickets left and snatched them up straight away," he explained. "Also, I saw the date was Feb. 10, so I could make it into a Valentine's Day weekend - kill two birds with one stone." He printed out the tickets and presented them to his girlfriend on Christmas Day, adding that nobody noticed that they would be seeing the wrong band. "Fast forward a month and we get the actual tickets through the post - brilliant! Up they went on the board - still nobody had noticed my mistake. It was only until the Wednesday before when my gf wanted to know who was supporting them. She couldn't find anything about the Red Hot Chili Peppers performing in Belfast." Once realizing they had flown to Belfast to see the bagpipers, they could do nothing but laugh. "(We) just had to laugh about it - what else was there to do! The only saving grace was that we had found out three days before and not while we were in the arena!" The pair went to the concert anyway and said they had a good time. The couple hopes to see the real Chili Peppers in the future.